My Living DNA results are now in. Some very interesting, surprisingly accurate, and some not so accurate results. I will have a full review up in a couple of days, once one or two of my questions have been cleared by the Living DNA team. I will say now though that I highly recommend taking the test, especially with future developments of the product in the pipeline. A brand new DNA test is available as of late September. 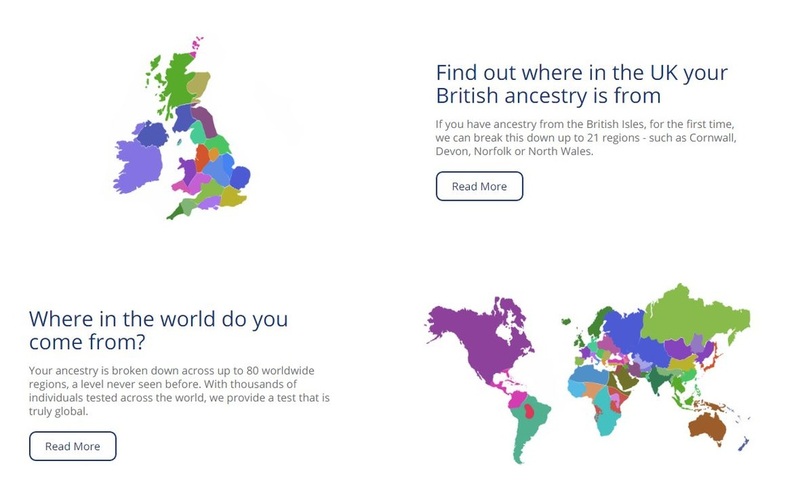 Somerset based Living DNA, who are are a subsidiary of DNA Worldwide Group, offer Y DNA, mt DNA and autosmal all for the price of £120. Perhaps the biggest feature of their test though, is the ability to predict locations more specifically. The UK has been split up into twenty one regions, as well as some more precise areas in other countries, e.g. North and South Italy. I have sent off samples for this test and am expecting my results in about ten weeks times. I will be really interested to see just how accurate the British regions are, as I have several widely spread clusters. I will also be interested to see how much of my Irish ancestry will fall into the 'South West Scotland/Northern Ireland region and how much into the 'Irish' region. Yet another interesting feature is the ability to view your ethnicity throughout different periods of history. I have always wondered how long one has to live in a country before they classify as that nationality. I was surprised by how Irish and Scandinavian I appeared in Ancestry and FTDNA DNA tests, as many of my ancestors from Ireland moved over in the 16th and 17th centuries. I also have no record of any Scandinavian in my pedigree so will be intrigued as to how the percentage of Scandinavian changes over time periods. ​Check back in about ten weeks for my verdict on the test. Regions that are tested for. Apologies to you if you are reading this, as the Townsend page is still unfinished. Unfortunately there will be little development on this website for some time, because of a current lack of inspiration or flair. Check back sporadically and a huge chunk may or may not have been added. Today's Google doodle marks the 200th anniversary of the mathematician George Boole's birthday. George came to Ireland in about 1849 when he was appointed the first professor of mathematics at Queen's College, Cork. George Boole's sister, Mary Ann, educated George Francis FitzGerald and his siblings when they were younger. Presumably Mary Ann had come over to Cork with her brother. Whether or not George FitzGerald received any guidance or ever met George Boole I don't know, but he must have been an inspiration to him. Got slightly carried away with my research into the Stoney Family and missed out the Morris page completely, I might leave it for a while. The next page will be on the Burton family. Straight from one page to the next. The Bindon has been done. There is a large absence of dates and children in some generations, any information would be great. Also, if anyone knows which Rockmount is being referred to, when mentioned in connection with the Bindon family? No more pages for a while now.